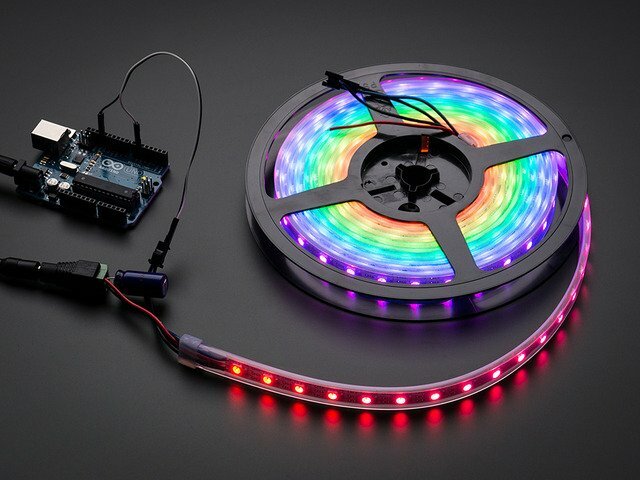 Power from the battery is split four ways: to the Arduino, the Bluetooth module, and to both ends of the NeoPixel strip. 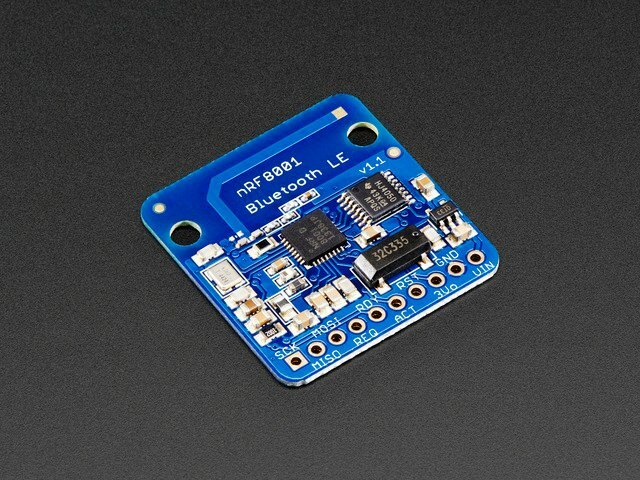 The Bluetooth LE module is connected to the Arduino’s SPI bus and a few control pins. This is the same wiring scheme as in the Bluefruit LE tutorial, but adapted for the Arduino Micro’s SPI pin arrangement. SCK, MISO and MOSI connect to the same pins on the Arduino (the latter two are labeled MI and MO on the Micro). REQ goes to pin 10, RDY to pin 2, and RST to pin 9 (ACT is skipped). The labels on the Arduino Micro pins are very tiny! It may be easier just to count the pin positions in the diagram above. The NeoPixel data input is connected to pin 6 on the Arduino. That 2-pin plug we salvaged earlier is now used to make the electronics removable for troubleshooting or modifications. Start by cutting 6 wires about 2 inches (5 cm) long. Strip about 1/4" (6 mm) insulation from one end of each. 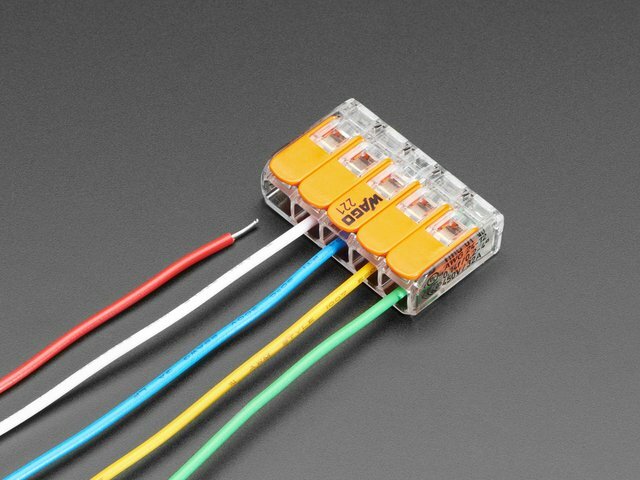 If you have a few different colors of wire, it makes things a little easier to follow, but it’s not required. Just follow very methodically to be certain you’re making the right connections. Solder these six wires to the Bluefruit board, starting from the left: SCK, MISO, MOSI, REQ, RDY and RST, skipping over the ACT pin. After soldering, trim the wires on the back of the board so they don’t stick out too much. Now cut 4 wires about 10 inches (25 cm) long, and strip them at one end. Solder these wires to the VIN and GND points on the Bluetooth board and the 5V and GND points on the Arduino. After soldering, trim these wires on the back as you did before. Now solder the 2-pin JST connector to the Arduino. 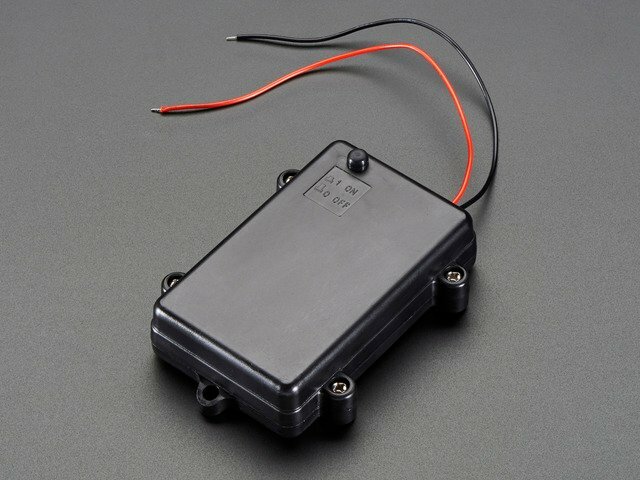 The WHITE wire connects to Arduino PIN 6. The BLACK wire connects to GND (there’s a second GND connection on this edge of the board). Arrange the two boards roughly as you expect to have them on or in the hat. Cut each of the 6 data wires down to its required length, strip the end and solder to the Arduino. Then trim any excess wire on the back. Here we’ve started with SCK on the Bluefruit board to SCK on the Arduino Micro. Repeat with the remaining 5 wires. Each will be a slightly different length; trim as necessary. This guide was first published on May 01, 2014. It was last updated on May 01, 2014. This page (Soldering) was last updated on Apr 20, 2019.